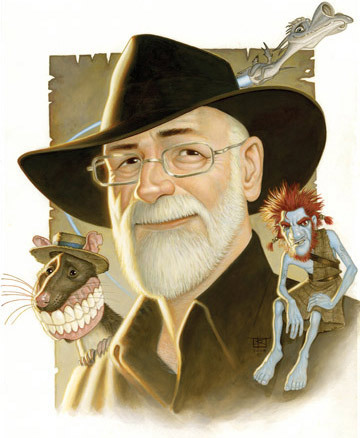 My first Terry Pratchett book was The Wee Free Men. A good friend had been recommending Pratchett’s young adult books for years, and when I couldn’t get round to reading them she eventually just bought me two as a present. That’s a very effective way to force me to read a book as I can’t leave books lying around unread for long, or give them away without at least checking them out. So I read The Wee Free Men, and then I immediately read A Hat Full of Sky. And so began the biggest reading journey of my life. Straight after those two, I read the remaining Tiffany Aching books. Then I read every Discworld book involving the witches. Then I moved on to the Death storyline. Then I went back to the beginning and read all the remaining books in chronological order. Four years later I had made my way through 40 Discworld books and my world was changed forever. Terry Pratchett passed earlier this week and in his memory I wanted to make something. You know, paint a picture, build a statue – whatever. But I’m no good at drawing or sculpting or building things. I do all right with words, though. 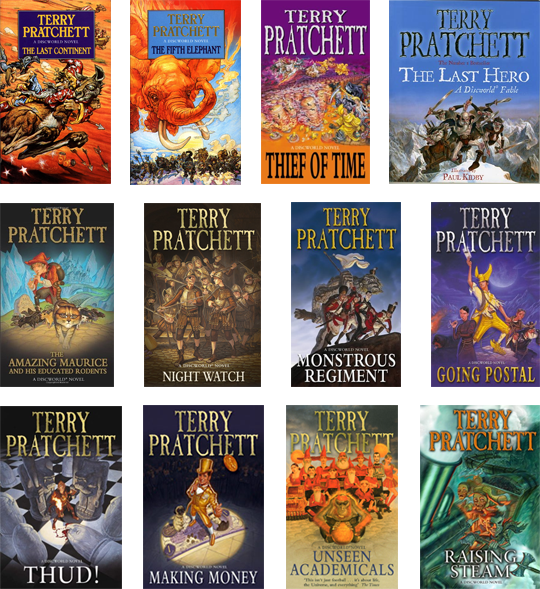 So these are my reviews of all the Discworld, and an account of most of my reading journey of the past five years, collected here as a tribute to the man who created this beautiful world and shared it with everyone willing to open their minds. Level up: After four years I’ve finally finished my Discworld marathon. There has been a lot of Discworld reading going on this year, so I’ve decided to bunch them all into one big, final super-Discworld review before I move on to new adventures – that is, the zillion other books that have been piling up on my shelf for the past six months. Get ready for time-travelling monks, vampires, werewolves, talking rats and cunning cats, dragon-powered spaceships, coppers, crooks, AUSTRALIANS (except they’re not really Australians because Terry Pratchett is good at this diplomacy thing), public services and new technology.